I awaken to the smell of coffee and weigh the merits of climbing out of my sleeping bag before the sun is fully up. As I lay still I hear a peregrine falcon screech echoing down the canyon. 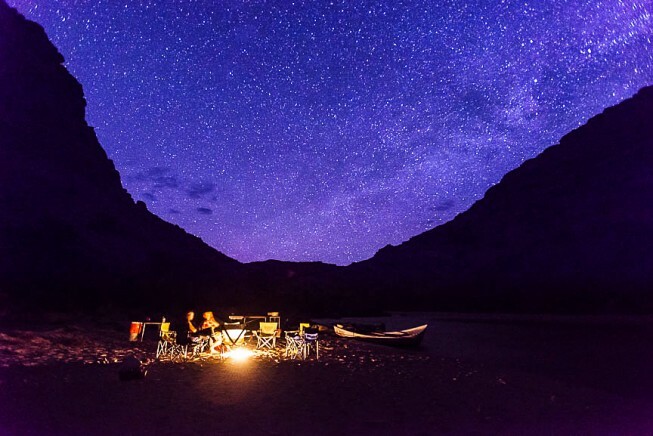 I glance over at Glen, my husband, who is also staring up at the tent roof and ask, “Did you hear that?” As dawn creeps down the side of the red canyon walls I hear our fellow campers starting to stir as I sit up and shake the night’s sand from my hair. Glen and I both started laughing at the thought of one more week in a tent. But this time it is for love of the great outdoors and relaxation instead of avoiding a building collapse in earthquake country. Glen and I just returned from a month of Red Cross disaster volunteer work in Nepal. We arrived in Nepal days after the first 7.8 earthquake that killed over 8,000 people, and were still there during the next, slightly smaller 7.4 earthquake. Daily aftershocks, strong tremors and the occasional landslide or building collapse kept us frayed and edgy; sleeping in tents ensured a wake-up and gave peace of mind. Now, here we were back safely, but sleeping in a tent again. We were back from Nepal with only 4 days to prepare for this trip of a lifetime; a rafting trip on the Colorado River through Cataract Canyon. But sleeping in a tent was the only thing this experience had in common with disaster response work. It was surreal to come from the destroyed villages and dehydrated food of Nepal to this serene, luxury camping under towering vermilion canyon walls. Under the circumstances, OARS would have rescheduled us, but this was ‘snow melt’ period – when the rapids raged with the flush of melting mountain snowpack. Months earlier, before the Nepal earthquake, we invited Glen’s kids and a grandson along and they were counting on this vacation. So here we were, the stress of Nepal fading as we blended and socialized with the group of 14 other adventure travelers seeking the thrill of famous Cataract Canyon rapids at high water. Another rafter called it ‘glamping’, but I think this is more authentic adventure. Our five huge, massively laden oar rafts and dories are hauling thousands of pounds of gear and food; much of which has to be unloaded at a new camp each night and reloaded each morning. Getting downriver is like moving your daughter out of her dorm room twice a day for five days…using a bucket brigade on sandy, slippery riverbanks. But Glen and I both love wilderness landscapes and sharing gypsy camp fires with our new friends every evening. Despite being bone tired from our month of hard living in Nepal, gliding through canyon geology like this and careening through Class IV rapids is a better way to decompress than just about anything I can think of. Every late afternoon we set up camp and then our wilderness cocktail hour begins. Our intrepid and fun crew sets out a spread of crackers, dips, cheese and chips as our dinner cooks in Dutch ovens. Beer and wine is shared by fellow rafters and Glen tells me that his cabernet tastes pretty good sipped out of an OARS mug. I drink hot tea to revive as I sit in the camp chair circle socializing and drying out in the setting sun. Dinner is a feast. Nothing fancy, just plenty of fresh food, which is what you want to eat in the great outdoors. Each night, our appetites stimulated by the exertion and fresh air, we chow down on hearty meals of fajitas, pork loin, pasta and salmon followed by nightly campfire desserts like Dutch oven birthday cake, and homemade brownies. Breakfast each morning is the real deal with pancakes, blueberries, raspberries, eggs, bacon and pretty good coffee. Life is good. “Why do they call the toilet a groover?” asks Brandon, Glen’s grandson. Good question. A guide told us the term ‘groover’ came from the days before they included the seat; you sat directly on the hard rims of a Vietnam-era 60 caliber ammo can, which left two deep grooves in your…well, you get the picture. And nothing is more important to camp morale than ‘groover feng shui’ or the placement of the two portable toilets in somewhat sparse natural seclusion. Pretty soon all 25 of us (20 rafters and five guides) are enjoying the spectacular views from the ‘groover’ – totally at home on the toilet as rafts and dories pass by on the river. Each day is a repeat of the first. 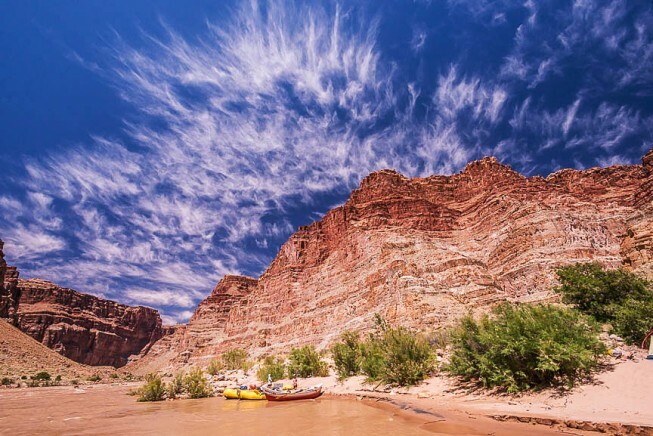 Floating and paddling past incredibly beautiful geologic formations, hiking up another canyon to see Anasazi ruins or petroglyphs, followed by lunch in the riverside shade. The first two days are mellow with mostly flat water. Day three is the start of the excitement. 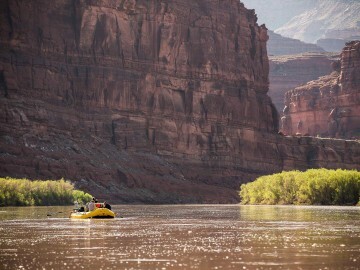 Rain gear, life jacket as tight as I can stand, helmet; it’s a glorious, sunny day on the Colorado River and I feel like I’m suited up for combat. When signing up for this raft trip we were told that Cataract Canyon is not for the faint of heart. I am ever-so-slightly nervous even though this is my seventh rafting trip, our guides are seasoned and I know what to expect. I swelter in the heat and get goosebumps from the snowmelt river water at the same time. After two days of anticipation, the group’s mood soars as we get nearer the rapids, some of North America’s biggest. We are all pumped. Lucky for us, the melting snow has created perfect conditions; exciting but not death defying. Our rafts get lively at the rapids and we get soaked as the water comes crashing down on us. 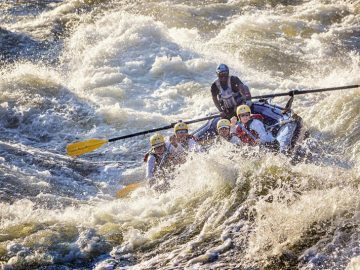 Our guides are pros and thread the towering rapids, pulling hard to avoid the swirls and eddies between the boulders and falls. 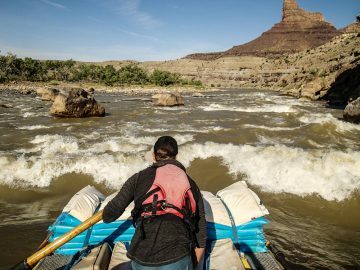 They make it look easy and we are reminded this is not their first rodeo – this is our lead guide’s 17th year of river guiding. Then we pull over and as we talk through our excitement, the guides proceed to assemble a gourmet lunch on the riverbank. As a fellow rafter put it; it’s as if our airline pilot just walked back to serve us a meal. Our life is in their hands and then they wait on us hand and foot. The next day is packed with the thrill of a succession of rapids. All the guides nail their runs through the thundering falls and our entire group is able to hang on and avoid drama by staying aboard the violently bucking rafts. At the last major rapid we beam at each other, soaked, ecstatic and full of pride. We made it. Our last day is all about our pickup rendezvous at the Lake Powell ramp. 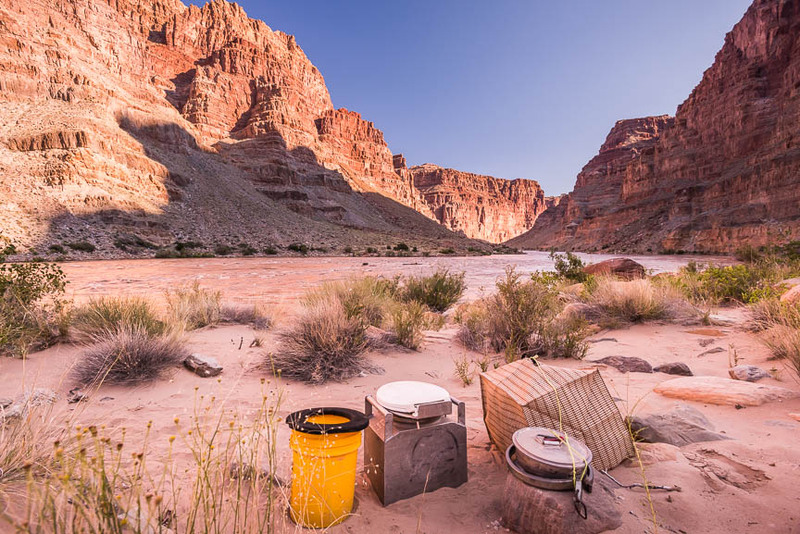 We grab our gear with a last bucket brigade and head up to an airstrip where small planes take our group high up above the canyon tracing our rafting route from a different vantage point. It was the perfect way to end the trip. I looked around at the other contented faces of the group and felt that we all had been through something together. 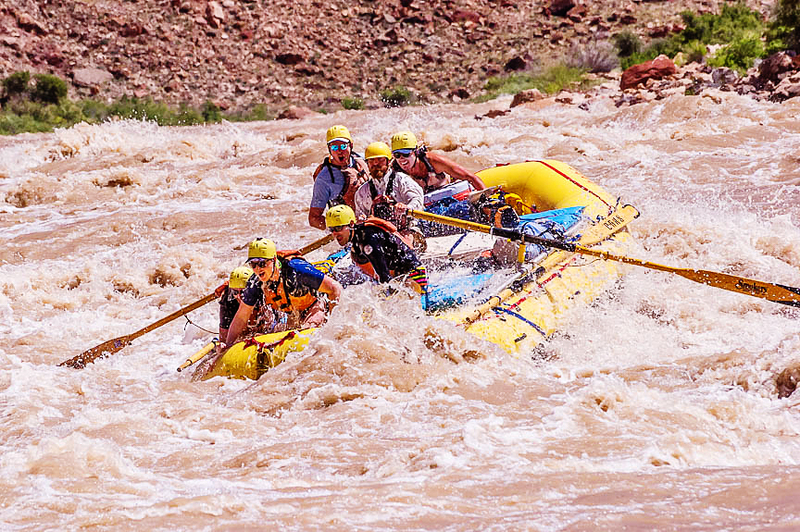 As I looked down from the small plane to the Colorado River below I watched another group of rafters traversing rapids that had been exciting and scary up close and personal. Now, like the rapids on the river below us, my hard times in Nepal were far behind me. 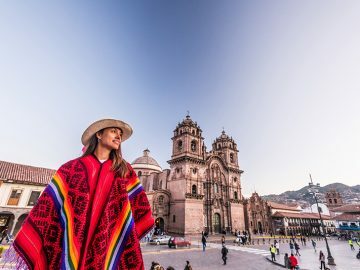 Julie Bradley’s life has been marked with the good fortune of a profession and life marked with adventure, travel and a life partner to share it with.